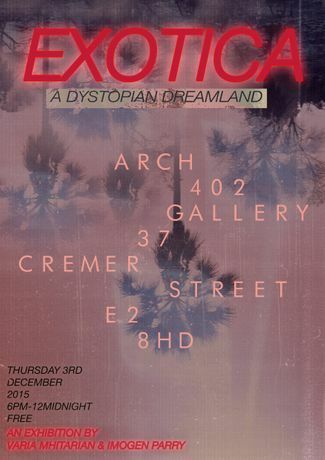 'Exotica' - explore a paradise tainted by human excess. ‘Exotica’ is a multimedia exhibition that examines tropical sublimity and its decay as a result of human consumption and development. Common components associated with paradisiacal and exotic imagery will be explored alongside darker elements that we associate with modern society. We aim to combine music and visual art for one night only, immersing visitors in a party-like atmosphere. The show will take a playful angle on the symbolism of escapist ideals through a combination of up-and-coming London talent, and established references to popular culture. Inspired by the artists’ personal experiences as well as the shared yearning of urban citizens for a slice of tropical beauty and the hedonistic possibilities it brings, Exotica aims to create an ambience of idyllic decadence with a dark and unsettling heartbeat. Curated by Varia Mhitarian and Imogen Parry. The exhibition takes place on Thursday 3rd December, 6pm – 12 am at Arch 402 Gallery, Cremer Street, E2 8HD.